Emmanuel Macron's visit to Africa has been tainted not only by attacks and protest on his first stop in Burkina Faso. The president of the African nation apparently wasn't so much into French humor either, leaving the room during Macron's speech at a local university. 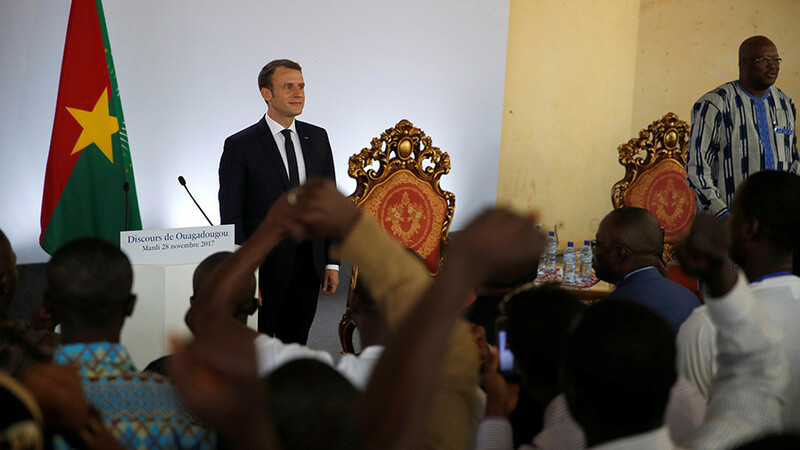 Meeting with the students of the University of Ouagadougou in Burkina Faso on Tuesday, the French leader reiterated his position that France’s paternalistic approach to the African countries should be ended. The tradition of African nations reproaching France in case if something goes wrong should also be broken, he said, adding that the students spoke to him "as if he were a president of Burkina Faso" when complaining about the poor state of the university. "Sometimes you talk to me like I'm still a colonial power," the French president said. "But I do not want to deal with electricity in universities in Burkina Faso," Macron added, smiling. Apparently warmed up by a mix of laughter, applause and whistling in the audience, he carried on. "It is the work of the president [of Burkina Faso]," he said, pointing at president Roch Marc Christian Kabore, who was listening to Macron's speech from the same stage. At this point, Kabore suddenly stood up and left the room. "He's leaving... Stay there! So, he went to repair the air conditioning," Macron shouted after the African state leader. The video posted on Macron's Twitter account has been edited to exclude his comments addressed to Kabore. Social media users reacted with saying the French leader "disrespected" his counterpart, having displayed "arrogance" and "immaturity." "Imagine a foreign country president having such an attitude in France and say the same thing to Macron," a Twitter user pointed out. Hours before the French delegation arrived in Burkina Faso, two unknown hooded assailants on a motorcycle propelled a hand grenade at a bus carrying French troops. The attackers missed their intended target and wounded three civilians instead. The French president acknowledged the incident, but tried to downplay it, shifting the focus on the persisting terrorist insurgency in the country instead of stationed French troops. 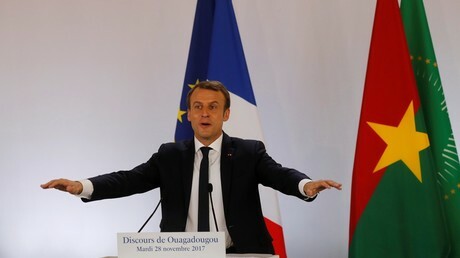 “It's only a grenade, I don't forget the deaths your people had to suffer yesterday, and in the weeks and months before,” Macron said during a press conference at Burkina Faso's presidential palace. “And they are victims of what? Not of a reaction to a visit by France's President. They are the victims of terrorism, of the deadly obscurantist terrorism against which we are all fighting with determination,” he added. In a separate incident, the French delegation’s convoy was pelted with stones, and at least one vehicle was damaged. Macron was not in the convoy at the moment of the attack, as the president was meeting with his Burkina Faso’s counterpart Roch Marc Kabore, according to Macron's spokesman Bruno Roger-Petit. — radioomega (@radiosomega) 28 ноября 2017 г. The demonstrators tried to erect barricades on the road and set tires on fire. The riot police stepped in and deployed tear gas to disperse the crowds. — DANSOU Romuald (@229_romuald) 28 ноября 2017 г.
France has complicated relations with its former African colonies, which have been independent since 1960s. Their ties with the former metropole, however, were never completely severed. France has intervened military more than 30 times in the continent since the decolonization of Africa and has its troops stationed in a number of its former colonies. Burkina Faso is not an exception, where French contingent participates in the anti-terrorism Operation Barkhane, which commenced back in 2014. On Tuesday, while responding to a question at the university why France sends more soldiers in than it receives African exchange students, the French president stated that the troops should only be “applauded” for their service.